Today only, while supplies last, get one of these AquaSonic Black Series Ultrasonic Whitening Toothbrush for ONLY $29.99 (Retail $99.99)! The AquaSonic Black Series Ultrasonic Whitening Toothbrush has an industry leading ultra powerful 40,000 VPM Motor to whiten and polish teeth while providing a deep clean. 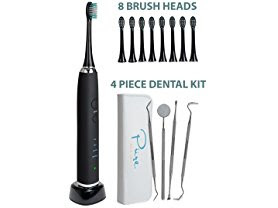 It has 4 distinct cleaning modes including: "Clean" for standard brushing, "Soft" for sensitive teeth, "Whiten" which uses the full 40,000 VPM to dissolve surface stains and whiten teeth over time, and "Massage" which uses pulsating vibrations to boost blood circulation around teeth and gums to improve complete oral health profile. Amazon Prime Members receive Free Shipping otherwise $5 Flat Rate Shipping will apply.